When the winter months arrive it can sometimes be difficult to avoid taking your dog out for a walk after dark. It can be much more tricky in terms of visibility, road safety and keeping track of your dog’s movements. Here are a number of pointers for walking your dog safely in the dark. If you have to walk on any routes that are on or near a road or traffic, whether that is cyclists or motorists, then it is important to make sure that you and your dog are easy to spot. Make sure that you don’t wear dark clothes, the brighter you are, the better! You could even consider wearing a high visibility vest, tabard, cuffs or a head torch. Don’t worry about looking ridiculous; safety comes first! There are a wide variety of visibility products out there for dogs, some better than others. Here are a few recommended suggestions. The BSEEN LED Dog Collars are incredibly popular, well reviewed, and they are also very reasonably priced which is, of course, a bonus. 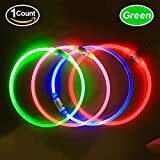 These lightweight LED tubes come in a one size fits all option, and you just cut it to shape (be careful as you don’t get a do-over if you cut it too small). It is rechargeable and comes with a USB cable, and you can choose from 3 different light setting options; a slow flash, a quick flash or a constant glow. They are tough, very bright and, in terms of light up products which are often not so durable, they are very reliable. They also come in a variety of colour options and, unlike some light up collars, they are not too bulky around your dog’s neck. The main issue with these collars is that, if they get caught on something or they are not firmly secured when putting together they can come off and get lost. They are a complimentary collar and not designed for a leash to be attached to. Your dog will still have to wear their normal collar or harness too. Be aware that if you have a very long haired dog that has a thick mane then sometimes this collar can get lost underneath all the hair and it is not so effective. If you would prefer something that attaches to your dog’s collar or harness securely with velcro loops, then the Apace Vision LED Safety Lights could be a good choice. They come in a pack of two, so you have a spare, or you could use one to attach to yourself or another dog if you have a multi-dog household. They are lightweight but robust and they have a long battery life (no recharging option with these ones though). If you want to give your dog top illumination, especially if they are hairier and normal collars or lights get lost in the fur, then you could consider the Noxgear Lighthound Harness. It is a much more expensive investment though so would only be recommended if you know you are going to get lots of practical use out of it. Your dog will still be visible even if they turn away from you or stick their head in a bush (with the collars and collar attachments, depending on which way your dog is facing, you may not always see the light). This well-reviewed light up harness is rechargeable and safe to use in the rain too. The harness lets you select which colour you want to use (there are eight options) and there are also six light modes too so you can choose the speed and flash type that is created. Unlike a lot of light up harnesses, this one is well made and has a comfortable fit for most dogs, it is available in 4 very adjustable sizes. The leash attachment is not as sturdy as some normal harnesses though so for very strong dogs you would need to consider this. 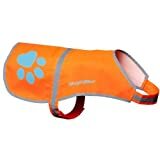 If you don’t want to use a light up product, or you want more overall visibility, then you could consider using a high visibility vest with reflective strips for your dog. This is most effective for showing up under the lights of oncoming motorists or cyclists though so if there are no lights, it will not be as visible. You could always carry a flashlight to shine onto your dog if you are using it in an enclosed space and they are off leash too though. The High Vis Vest from Safety Pup gets very good reviews for being well made, durable, giving a good fit and for the high vis strips being extremely effective. If you do want your dog to be able to play in the garden or in a safe off-leash space in the dark then you need to get something that they are more likely to be able to see. There are a lot of different options but, unfortunately, a lot of them are not well reviewed in terms of their reliability and robustness. Two that do frequently come up as being amongst the best of the bunch are the Chuckit Glow In the Dark Balls and the Nite Ize Light Up Ball. The Chuckit toys are known for being durable and high quality. The Chuckit! Max Glow Ball is no exception. 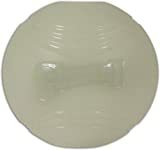 The ball is very tough so will work well for dogs that are hard on their toys. It comes in a variety of sizes so you can select the one safest for your dog’s size. You just need to pop it under a bright light for a while before you take it out and it will continue to glow for around 20 minutes. There are no batteries and no risk of them swallowing mechanical elements. If you want to charge it again while you are out, if you take a flashlight you can hold it up against this to get it glowing again. Even if you are not using it in the dark, this is a great general ball option. If you would prefer a light up ball option, it can often be a struggle to find something that is tough and reliable. The Nite Ize GlowStreak LED Dog Ball receives some of the most consistently positive reviews of those on the market. This is a motion activated ball, so it lights up as soon as it hits the ground after being thrown. You just need to make sure that your dog finds it though as the lights switch off automatically after ten minutes of inactivity. The batteries can be replaced, and it is waterproof and floats in water too, although we, of course, wouldn’t recommend playing in the water in the dark! It is not as robust a ball as the Chuckit Max Glow, it can be hard on the teeth, and some people complain about the reliability within the battery casing. Out of all the light up dog balls on the market though it still seems to come out on or near the top. Ideally, you don’t want to be walking on or near busy or unlit roads in the dark. If you do following the safety points are worth considering. Unless you are in a safe enclosed space or you know the area very well, and your dog has a super good recall and stays close we would suggest keeping your dog on a leash during walks in the dark. It is so easy to lose sight of them, and there can be hazards that crop up suddenly. Your dog is also likely to get more easily spooked in the dark, and they could miss seeing a hazard themselves and are more likely to get injured, disorientated or lost. You could always use a training lead or long line to give them a bit more freedom in areas away from the road. If you do choose to let your dog off leash, ideally pick an enclosed or familiar area and be sure they have a solid recall. You may also want to consider using a dog tracking device so that if they do get disorientated, it is easier to reunite with them. The Whistle 3 GPS Pet Tracker & Activity Monitor is a very well reviewed and popular model. Where possible, for security, and also from a visibility perspective, try to stick to street lit areas. If you have to go outwith street lit areas then carrying a flashlight may be a sensible precaution, or if your phone has one this saves you carrying something extra. The flashlight can also come in handy if you are in an unlit area and you are trying to find your dog’s poop. It can be more tricky than normal locating it, unless you hover directly over your dog which is not ideal for them and sometimes not practical anyway. You want to remain a responsible dog owner though so being vigilant and having something to help you locate the offending item can be helpful. From a security perspective, it is sensible to stick to an area that you know, where possible, when you are walking in the dark. It can be more relaxing for you and your dog. It also means that you are less likely to come across an unexpected hazard that can be tricky to negotiate in the dark. Another reason for keeping your dog on a leash in the dark, especially if you live in a more rural area, is that this is the time when a lot more wildlife will start to appear. If your dog was to startle a nocturnal creature they can often be aggressive in their retaliation. It is not uncommon for a dog to be hit by the noxious odours from a skunk that sprays them after being surprised. From a safety perspective, whether you are walking with a dog or not, it is recommended that you don’t have headphones in when walking at night. If someone threatening was approaching you from behind suddenly, you will have less time to react if you do not hear them coming. Whilst most night walks will be perfectly safe, it is still important to recognise that there is an increased security risk when walking at night. Because of this, it is also recommended that you carry your phone for any emergency situations. Sometimes just having it there can also help you feel more relaxed too. If you are leaving for a walk just as the sun is going down don’t forget that this can be the time that bugs like mosquitos can be at their most active. So if it is a time of year or location where these bugs are prevalent you will want to make sure that you are appropriately covered up and you may even want to consider using some insect repellant too.